Dr. Hinkelman is a research scientist at the Joint Institute for the Study of the Atmosphere and Ocean of the University of Washington. Her research interests include the Earth’s energy budget, long-term trends in surface insolation, how variations in insolation affect solar power production, and the effect of clouds on atmospheric radiative transfer. 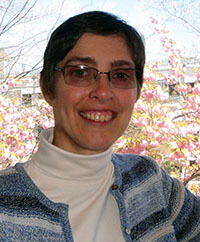 Dr. Hinkelman has worked extensively with ground-based measurements and satellite retrievals of solar and infrared fluxes as well as Monte Carlo radiative transfer computations. Her current projects involve a variety of applications of radiation data. Her main focus is on using CloudSat, Calipso, and CERES satellitedata to evaluate the representation of clouds and radiative processes in NASA’s Modern-Era Retrospective Analysis for Research and Applications (MERRA). This includes examining features in the vertical direction, which was not possible prior to the launching of these profiling instruments. Previously, Dr. Hinkelman led a project to test the utility of satellite radiation data as input to snowmelt models. This included testing the relative importance of spatial and temporal resolution in the flux data to snowmelt. Her most recent area of application is solar energy, where her projects focus on characterizing solar irradiance variability and its sources at small spatial scales. This knowledge is important for the inclusion of solar energy on the larger electrical grid. The aim of all of Dr. Hinkelman’s research is to improve our understanding of radiative transfer through the atmosphere and to apply this understanding to practical problems with societal relevance. “Differences between along-wind and cross-wind solar irradiance variability on small spatial scales,” L. M. Hinkelman, Solar Energy, 88:192-203, doi:10.1016/j.solener.2012.11.011 (2013). Hinkelman, L. M., 2019: The global radiative energy budget in MERRA Versions 1 and 2: Evaluation with respect to CERES EBAF data, J. Clim., in revision. Schmeisser, L., L. M. Hinkelman, and T. P. Ackerman, 2018: Evaluation of radiation and clouds from five reanalysis products in the northeast Pacific Ocean, J. Geophys. Res., 123, doi:10.1029/2018JD028805. “Building the Sun4Cast system: Improvements in solar power forecasting,” Haupt, S. E., B. Kosović, T. Jensen, J. K. Lazo, J. A. Lee, P. A., Jiménez, J. Cowie, G. Wiener, T. C. McCandless, M. Rogers, S. Miller, M. Sengupta, Y. Xie, L. M. Hinkelman, P. Kalb, and J. Heiser, Bull. Amer. Meteorol. Soc., 99(1):121-135, doi:10.1175/BAMS-D-16-0221.1 (2018). “Relating solar resource and its variability to weather and climate across the Northwestern United States,” Hinkelman, L. M., and N. Schaeffer, Solar Energy, 157C:966-978, 10.1016/j.solener.2017.07.060 (2017). “A copula method for estimating aggregate instantaneous solar irradiance in spatial networks,” Munkhammar, J., J. Widén, and L. M. Hinkelman, Solar Energy, 143:10-21, doi:10.1016/j.solener.2016.12.022 (2017). “A critical evaluation of modeled solar irradiance over California for hydrologic and land-surface modeling,” Lapo, E. K., L. M. Hinkelman, E. Sumargo, M. Hughes, and J. D. Lundquist, J. Geophys. Res., 121, doi:10.1002/2016JD025527 (2016). “Coupling sky images with radiative transfer models: A new method to estimate cloud optical depth,” Mejia, F. A., B. Kurtz, K. Murray, L. M. Hinkelman, M. Sengupta, Y. Xie, and J. Kleissl, Atmos. Meas. Tech., 9:4151-4165, doi:10.5194/amt-9-4151-2016 (2016). “Regime-dependent short-range solar irradiance forecasting,” McCandless, T., G. S. Young, S. E. Haupt, and L. M. Hinkelman, J. Appl. Meteorol. Clim., 55:1599-1613, doi:10.1175/JAMC-D-15-0354.1 (2016). “Shortwave radiative fluxes on slopes,” Ma, Y., R. T. Pinker, C. Li, M. M. Wonsick, and L. M. Hinkelman, J. Appl. Meteorol. Clim., 55:1513-1532, doi:10.1175/JAMC-D-15-0178.1 (2016). “Influence of synoptic weather patterns on solar irradiance variability in northern Europe,” Parding, K., B. G. Liepert, L. M. Hinkelman, T. P. Ackerman, K.-F. Dagestad, and J. A. Osleth, J. Climate, 29(11):4229-4250, doi:10.1175/JCLI-D-15-0476.1 (2016). “A simple algorithm for identifying periods of snow accumulation on a radiometer,” Lapo, K. E., L. M. Hinkelman, C. Landry, A. Massman, and J. D. Lundquist, Water Resourc. Res., 51, doi: 10.1002/2015 WR017590 (2015). “Using CERES SYN surface irradiance data as forcing for snowmelt simulation in complex terrain,” Hinkelman, L. M., K. E. Lapo, N. C. Cristea, and J. D. Lundquist, J. Hydrometeor., 16:2133-2152, doi:10.1175/JHM-D-14-0179.1 (2015). “Impact of errors in the downwelling irradiances on simulations of snow water equivalent, snow surface temperature, and the snow energy balance,” Lapo, K. E., L. M. Hinkelman, M. S. Raleigh, and J. D. Lundquist. Water Resourc. Res., 51, doi:10.1002/2014WR016259 (2015). “Evaluation of ISCCP geostationary visible channel radiance calibration using the Moon,” Stone, T. C., W. B. Rossow, J. Ferrier, and L. M. Hinkelman, IEEE TGARS, 51:1255-1266, doi:10.1109/TGRS.2012.2237520 (2013).